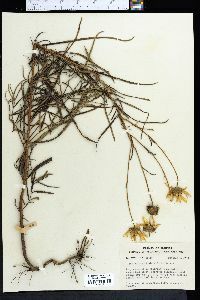 Perennials, 150-260 cm (rhizomatous). Stems erect, strigose or hirsute. Leaves basal and cauline; opposite or alternate; petioles 0.5-1 cm; blades (3-nerved distal to bases) linear-lanceolate to lanceolate, 9-22 cm × 0.7-4 cm, bases cuneate, margins entire or sub-­entire (usually slightly revolute), abaxial faces hispidulous to tomentulose, gland-dotted. Heads 1-15. Peduncles 1-13 cm. Involucres ± hemispheric, 13-18 mm diam. Phyllaries 25-35 (loose), lance-linear to lanceolate, 6-17 × 1.5-3 mm, apices acuminate, abaxial faces glabrate to sparsely strigose, gland-dotted. Paleae 5.5-6.5 mm, 3- (or 5-)toothed (distally strigose, gland-dotted). Ray florets 12-23; laminae 16-40 mm (abaxial faces gland-dotted ). Disc florets 100+; corollas 5-5.5 mm, lobes yellow or reddish; anthers dark brown or black, appendages dark. Cypselae 2.5-3 mm, glabrous; pappi of 2 (usually unequal) aristate scales 1.5-2.4 mm. 2n = 34. Flowering fall. 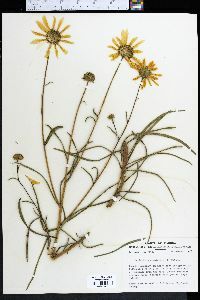 Wet soils, ditches, roadsides; 0-50+ m; Ala., Fla., Ga., La., S.C. Helianthus simulans is similar to H. angustifolius, but much more robust with larger leaves, and to H. floridanus, but with longer and narrower leaves. Some workers have described H. simulans as having yellow disc corollas; this is variable within the species; individuals with reddish disc corolla lobes also occur. It is becoming popular as a garden plant, which may increase its range and may lead to an increase in the occurrence of hybrids with H. angustifolius and H. floridanus. It may be present in Arkansas and Texas.